Indian Army is inviting all engineering stream students to apply for this Officers entry scheme 2018. All men as well as women can apply for this Indian army recruitment 2018. Those who are looking for the army jobs in India can apply for this recruitment process through online channel. 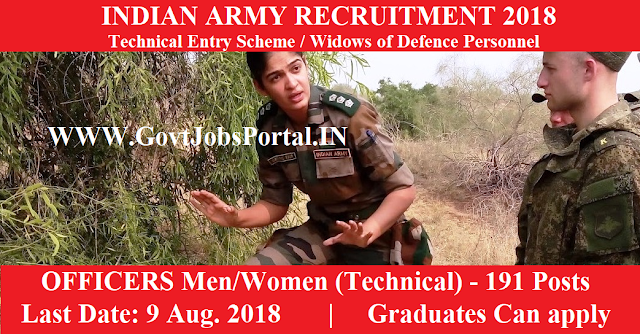 Various engineering streams students can apply for this Indian army recruitment 2018. We explained the detailed information below in this article, read this article carefully before applying these Government jobs under Indian army. Number of Vacancies: 191 Posts. Pay Band: Rs.56,100 per month. What eligibility Criteria for this Indian Army Recruitment? Education: All Engineering degree holder in the respective trade or stream can apply for these Government jobs in India. For SSC Technical Officer: Age must be in between 20 to 27 years. For Windows of Defence Personnel: Must have age less than 35 years. What is the application Fee for applying this Army recruitment 2018? Candidates need not to pay the application fee for this Indian army recruitment 2018. Those who are wishing to apply these Government jobs in India can apply online through the Indian Army official website. We share the direct link below for applying under IMPORTANT LINK Section. Check that section for more information. 12th July 2018 is the Starting Date for applying. 30th Sept. 2018 is Last Date for Window of defence personnel.